Sugar Snap Studio. Murdoch Books. ABC What Can She Be? is an educational early childhood non-fiction book suitable for small children between 3 and 6 years of age. It was published in November 2018 by the Walter Foster Jr imprint of Murdoch Books and was written and illustrated by Jessie Ford of Sugar Snap Studio. There were a couple of different things that attracted me to this book. One thing that jumped out to me was its title ABC What Can She Be?. I love books that have a strong positive message in them for girls. I also liked the colourful and eye-catching illustrations that were on the front cover. The book had a nice weight to it as well. It is a board book which is a type of children's book that is printed on pages made out of thick cardboard. ABC What Can She Be? is a great book not just for girls but for boys as well. It teaches kids that girls can be anything they want and there is no job that is outside of their reach. Jessie Ford explores 26 different careers in this book with a different letter and a job that starts with that letter presented on each page along with an illustration of a woman working in that career and a small description of what that job involves. I liked that the jobs that were presented weren't limited to traditionally feminine jobs like teaching and nursing. A wide range of jobs were all shown as things that girls can be like astronaut, botanist, engineer, firefighter, neurosurgeon, optometrist and quantum physicist just to name some. There is something for every type of girl out there. My favourite was W is for Writer. The fun part about reading this book to kids is the conversation it can start with them about what they want to be when they grow up. The book only shows a handful of possibilities of the types of careers that girls can do when they're older. The only limit is your imagination. For more information on ABC What Can She Be? click on the link below. Why? 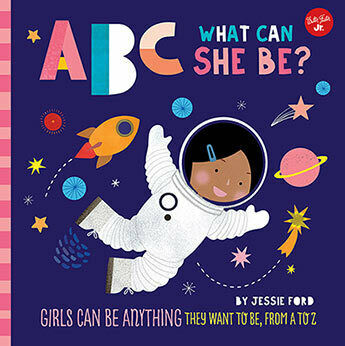 Teach your children the alphabet and introduce them to a world of exciting possibilities about what their future career could be by reading them ABC What Can She Be? When: ABC What Can She Be? Is the perfect book to read to kids to teach them the alphabet and to start a discussion with them about what they would like to be when they grow up.